Complimentary bites and first wine or beer free. Plenty of metered street parking. 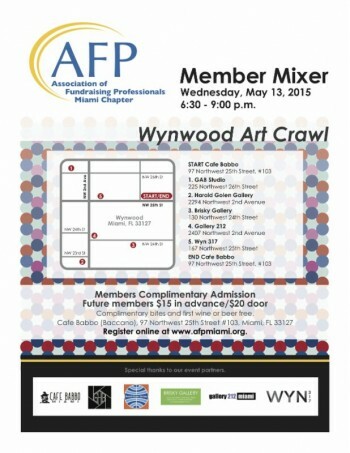 Join the Association of Fundraising Professionals Miami for a Wynwood Art Crawl. Meet at CafÃ© Babbo in Wynwood to pick up your map. Tour five art galleries in Miami’s fabulous Wynwood art district at your own pace. The galleries are open exclusively for us and you will have an opportunity to meet and speak with the gallerists at each one. The evening ends back at CafÃ© Babbo for more socializing, great refreshments and authentic Napolitano pizza. Everyone is welcome. This is an opportunity to learn more about what the AFP does and how it can help your organization.